The Catholic Hack! Episode No 45 – Gut Check! Part 2 – Joe McClane | Catholic: Author, Speaker, Evangelist & More! Tarek Saab (born September 24, 1978 in New Bedford, Massachusetts) was a candidate on NBC’s The Apprentice 5. He is the President of T. Saab Media, Inc. and the co-founder of Lionheart Apparel, a men’s clothing line he launched after his debut on The Apprentice. He has been named Kipling’s “Who’s Who Among Executives and Business Professionals” for 2008. He is a popular Catholic speaker and his book entitled Gut Check: Confronting Love, Work and Manhood in Your Twenties will release March 1st, 2008 through Spence Publishing. 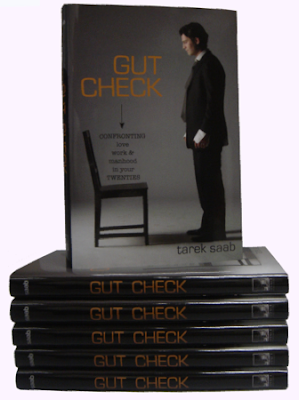 Were talking with Tarek Saab about is new book Gut Check. I really loved this book and I appreciated having an in depth conversation with Tarek. We take up where we left off last talking about our purpose, our origins, the ideal man and what won’t satisfy. Click on the banner, at the top of the page, and pick up your copy of Gut Check today.